Sarah Alexander has a solo exhibit of drawings and paintings in “Weathering The Storm” at Broadmoor Wildlife Sanctuary in Natick, MA during December and January. https://www.massaudubon.org/get-outdoors/wildlife-sanctuaries/broadmoor/exhibits. The exhibit will run from December 1, 2018 – January 31, 2019. Tatiana Flis has been accepted to the Vermont Studio Center for a January artist residency in painting/drawing. 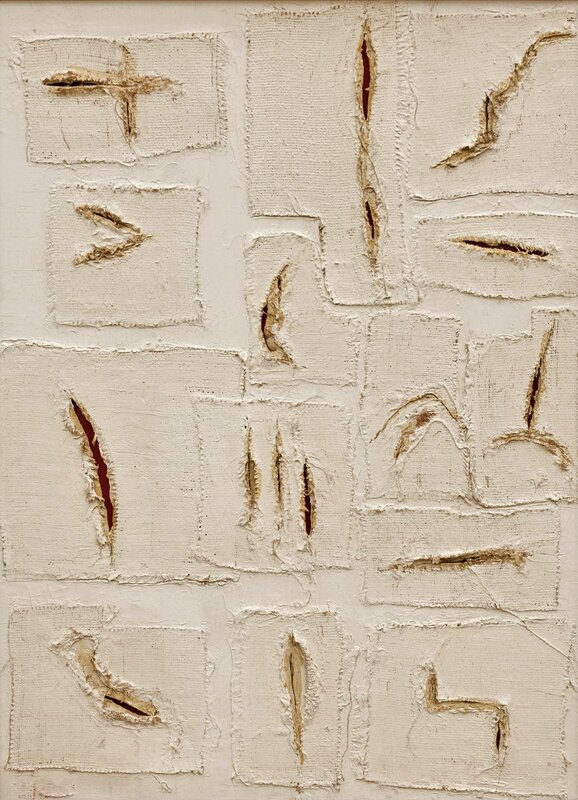 Mary Marley will be showing “Last Stop,” an encaustic painting in REAL TIME, an exhibit at the Piano Craft Gallery, 793 Tremont St., Boston, MA. Opening reception: Friday, January 4 from 6-9pm. The exhibition runs: Friday, January 4 - Sunday, January 27. Chris Plunkett has a solo exhibition of new and old work hung at the Oficio Offices,129 Newbury St, now through January. He is also exhibiting City and Land - a solo exhibition at the private residence of Joyce Linehan, Chief of Events and Operations for the City of Boston. Here, Joyce invites published authors to host private readings and books signings. Most recently Tom Almond read from his new book Bad Stories with Chris's work on display. 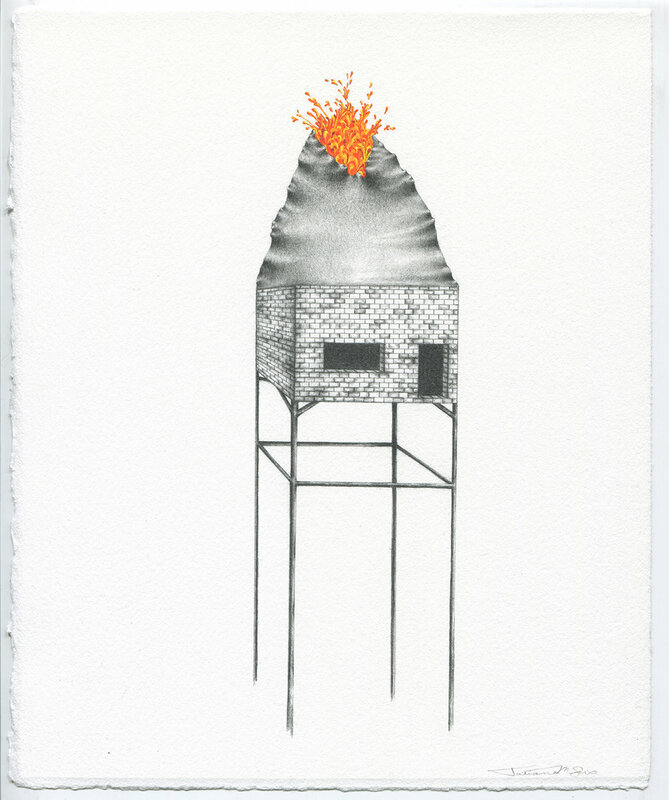 Chelsea Revelle has work in No Place Like Home at Mosesian Center for the Arts at 321 Arsenal Street, Watertown, MA. The exhibition runs until January 11. Allison Maria Rodriguez has work in The Cube Art Project, a public-art video installation at The Railyard, 350 Canopy Street, Lincoln, Nebraska. The exhibition will be up for a full year from Oct 2018 - Oct 2019. 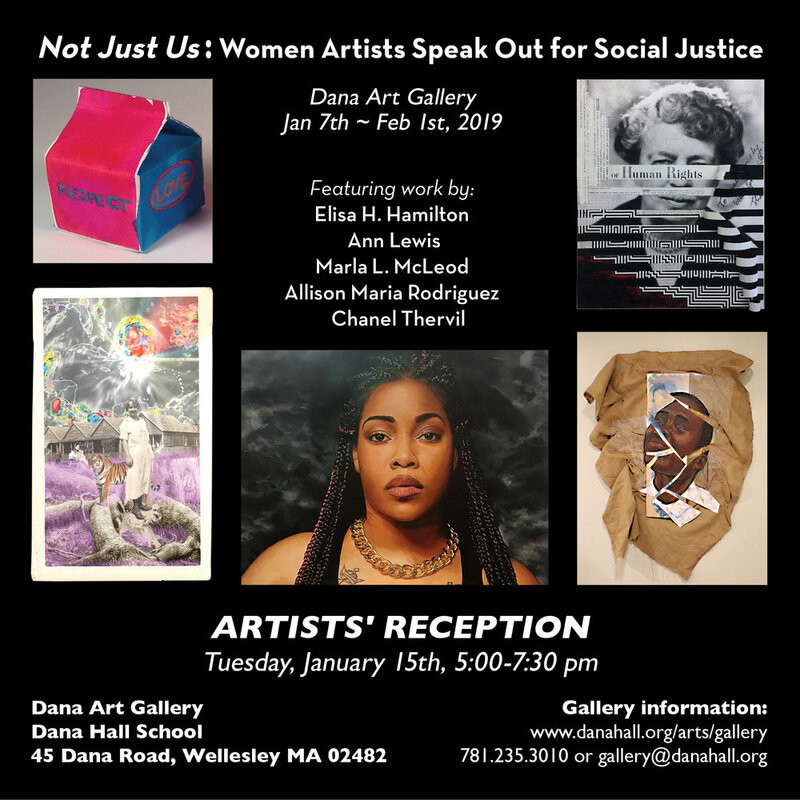 Rodriguez has work in Not Just Us: Women Artists Speak Out for Social Justice, a social-justice exhibition at The Dana Hall Art Gallery featuring five female artists: Elisa H. Hamilton, Ann Lewis, Marla L. McLeod, Allison Maria Rodriguez and Chanel Thervil. The exhibition runs from Jan. 7 – Feb. 1 with a reception on Tues, Jan. 15, 5pm – 7:30pm. Rodriguez will also participate in the Social Justice Day of Learning on January 22. Rodriguez has work in 13FOREST Gallery‘s annual invitational group exhibition, Plenty, on display until January 11. Alexandra Rozenman has work in I’m New Here: Perspectives on Migration curated by Boriana Kantcheva. The exhibition runs October 27, 2018-January 18, 2019 in the Shaira Ali Gallery at the Arlington Center for the Arts, 20 Academy Street, Arlington MA. Rozenman also has work in No Place Like Home at the Mosesian Center For the Arts at 321 Arsenal Street, Watertown, MA. The exhibition runs until January 11. Rebecca Skinner has a solo exhibit, Abandoned, at 6 Bridges Gallery located at 77 Main Street, Maynard, MA. The show runs January 2 - January 26. The opening reception is Saturday, January 12 from 4-6pm. Skinner also has a solo exhibition, Ruins: Exploring the Forgotten, at Brookline Arts Center located at 86 Monmouth Street, Brookline, MA. The exhibit runs Feb 7 – March 8 with an opening reception on Feb 7 from 6-8pm. 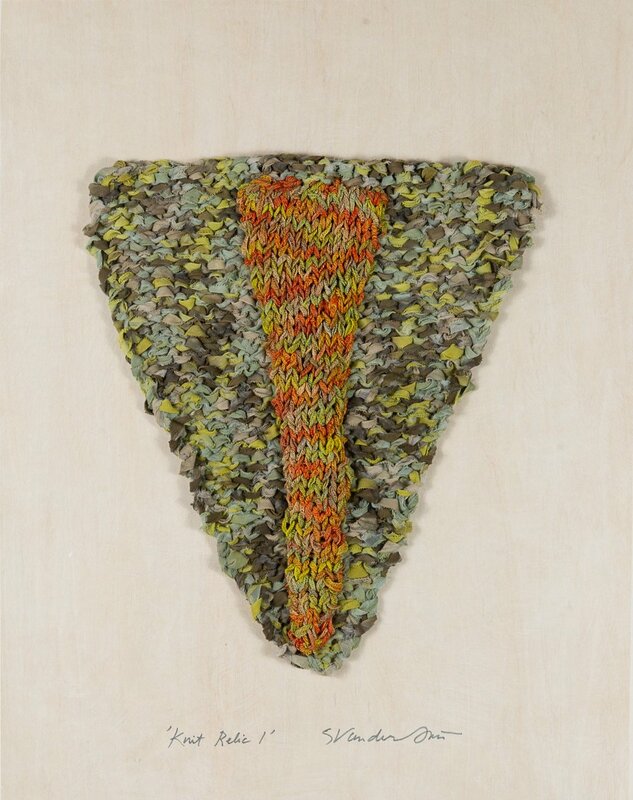 Sylvia Vander Sluis has three fiber works in the 2018 Members’ Exhibition at Attleboro Art Museum, 86 Park Street, Attleboro, MA. The exhibition runs Dec 6, 2018 - February 1, 2019. Paola Bidinelli has work in Winter Hours Exhibit at the Belmont Public Library, 336 Concord Ave, Belmont, MA 02478. The exhibition runs until the end of February. Bidinelli has work in Capitol Hill Exhibit at Capitol Hill Construction, 814 East 100 South, Salt Lake City, UT. The exhibition runs throughout January. Bidinelli has work in 801 Creative Women Winter Event at Ember SLC, 623 State Street, Salt Lake City, UT. An evening with Utah Creative Women will be held January 17. Bidinelli also has work in Opera Orlando at Sivers Salon, 6832 Walhalla Way, Windermere, FL. The exhibition runs January-February. Patty deGrandpre’s print was awarded the Prix de Print in the January/February issue of Art in Print journal.